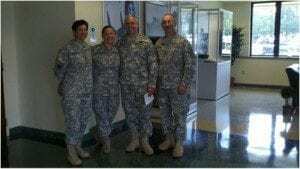 SSG Sonia Buchanan conducting a clothing exchange program. (From the collection of Sonia Buchanan). My decision to join the military came a little later in life than most. The military has always played a major role in my life. My father served in the Navy for 27 years. In fact, out of nine children, seven of us joined a branch of service or married someone who was in the military. I was thirty-six years old and found myself going through a divorce after 17 years of marriage. Little did I know, my life as a stay-at-home, homeschooling mother of two was about to be turned upside down. In 2008, I was working part time at a martial arts school and knew a couple individuals who were in the Wisconsin Army National Guard. They knew of my situation and persuaded me to look at joining. I realized that being a newly single mother of two and having a degree in Fine Arts was not enough to support my family. Knowing the journey that lay ahead, I decided to join. In 2008, I went off to basic training. In 2009, I received an active duty position with the Wisconsin Army National Guard and from day one I knew I made the right decision. I was presented with a rare opportunity in the beginning of 2011. The first time in history USASOC (United States Army Special Operations Command) was going to hold an AANDS (Assessment and Selection) for females for a new addition to the Special Operations community, CST (Cultural Support Team). A CST is a two female team that allows specially selected and trained females to serve alongside SOF (Special Operations Forces) in a unique operating environment. The primary task of a CST is to engage a host nation’s female and adolescent population in support of USASOF (United States Army, Special Operations Forces) missions where their interaction with male service members may be deemed culturally inappropriate. There were 178 females from around the country who went through assessment and selection, and fifty were chosen. Five of the females were from Wisconsin; four from the Wisconsin Army National Guard, and the other from the Army Reserves. It definitely was the most physically and mentally grueling experience in my life. After selection, we spent two and a half months at Ft. Bragg, North Carolina attending SWCS (Special Warfare Center and School) for training in basic human behavior, Islamic and Afghan culture, women’s roles in Afghanistan, Dari and Pashtu language, hand-to-hand combat, warrior tasks and drills, weapons training and tribalism. Once we arrived in Afghanistan we flew to our respective locations to embed with the SOF unit to which we were assigned. I had the pleasure to work with all three SOF units, MARSOF (Marine Special Operations Force), ODA (Operation Detachment Alpha, Green Berets) and SEAL (Sea, Air, Land US Navy SF). I was first assigned to a MARSOF unit and our main objective in Farah was to be the conduit between the local government and the women in the surrounding villages. SSG Sonia Buchanan at a mobile medical clinic in a nearby village. (From the collection of Sonia Buchanan). Being one of the first females to serve alongside an all-male special ops unit was such an honor and a privilege. However, we knew going into the deployment that we may run into some resistance with some of the team guys and we were prepared. Our first obstacle we encountered was building rapport with the team guys. We were team players and were willing to pitch in whenever possible to assist with the mission. We were not there to change the way the guys lived day-to-day. We were well aware this was their environment and we needed to gain their trust, which didn’t take long at all. The entire team knew that cohesion and trust with one another is the most important thing for a successful mission. We were brothers in arms almost instantly. These men respected us from the beginning knowing what we went through in order to be selected. We experienced the same training the guys went through, just in a shorter timeframe. These guys went to school for two years. We went for two months. Even though I didn’t get the same amount of training time as the guys, I felt competent in my abilities. During the mission, we’d meet weekly with a group of elected women from the local area to assess their needs, identify resources, and organize a plan. We assisted them in developing programs to create revenue for their villages. One of the programs we developed with the women was a sewing program. We requested sewing materials through the local government on a special grant. We assisted the women with the grant proposal and its submission to the liaison for their Province. The grant provided 38 sewing machines, fabric, thread, and needles, which were utilized by women in rural villages. They made Afghan attire to sell at local bazaars for profit. Since growing poppies was now illegal, the women were so happy to fill the day doing something to help provide for their family. After a month we were moved to join a new team that just arrived in the Helmand province. We joined them in a little village in the Sagin district to assist them in a VSP (Village Stability Platform). This team of Green Berets was the definition of professional. From day one, we felt like a family. The environment was very austere; the comforts of home did not exist in this land. There was no running water, electricity, toilets, sofas or beds. It was two months before we felt the water from our first shower. Our main meal everyday was beans and rice. There was a stench in the air that permeated through everything we had; you could not escape it. It appeared to me that this civilization had not progressed in over 1,000 years. I thought to myself this desolate place would be home for awhile but we are here for a reason and that brought me contentment. Our daily tasks included foot marches throughout the villages, visiting medical clinics, either on site or a mobile clinic, searches and seizures, humanitarian assistance, facilitated civil-military operations, and combat missions and presence patrols. Our days varied so much and there was always something new going on. Most of the intelligence that we received was either from the women or from the adolescents. The children often came up to us and offered information. We had to remain vigilant and never let our guard down. SSG Sonia Buchanan attending SWCS graduation with state leadership, General Anderson, CSM Stopper and LTC Gerety (now COL Gerety). (From the collection of Sonia Buchanan). This incredible experience made me realize that no matter what culture or background you come from, we are alike in many ways. Women can relate to each other based on natural instincts. We are mothers and wives, daughters and sisters. We love to share and discuss things with our girlfriends. During the deployment, we offered to build a well closer to the village so that the women didn’t have to walk 2 miles every day to retrieve water. They begged us not to, because they explained that was the only time they had to talk with each other and gossip. The women would tell us often where their husbands were going, where they had been, and who they were conversing with. At the end of the day, women know what’s going on in the home and we can all relate to being the primary care-takers for the family. It was really hard to be away from my family during the deployment. I didn’t make the decision hastily. I discussed this with my two children and the decision for me to go was made by all of us, as my kids are my first priority. One of the toughest things during my deployment was the little communication I had with them. A random call with a satellite phone was about it. It was a constant internal struggle for me not being there for them. You miss out on all the little things happening in their day-to-day life that cannot be conveyed through an email or phone conversation. When you have a bad day all you want is to hold your kids and be comforted, as well as be there to comfort them. My faith and praying daily gave me peace. The best part of my experience was the feeling after the mission. I feel we made a real difference in the lives of the locals. We had the opportunity to build rapport with the families, help create a safer environment, and educate them in basic needs areas of health, welfare, and agriculture to create a more sustainable future for the Afghanis.